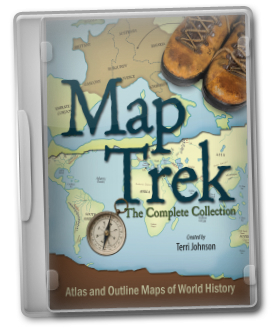 I just wanted to say THANK YOU for the Map Trek book. I LOVE it! It is beautiful!!!!! I cannot wait to use it this year with our history. I have never seen anything like it--YOU ARE AMAZING! Out of all the new books I bought this year, this is the one I am MOST excited about! Thank you, thank you, thank you!!!!!! Choose from individual ebooks, convenient CD-ROMs or a beautiful Complete Collection hardcover book with CD-ROM for easy printing. The choice is personal and the choice is yours. Grab your children by the hand. 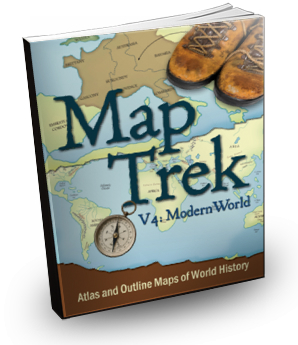 It's time to explore our world throughout history. 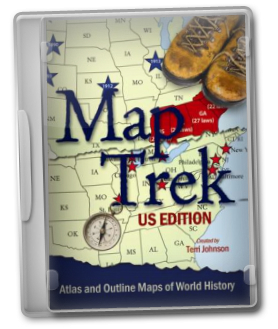 Let's take a map trek! 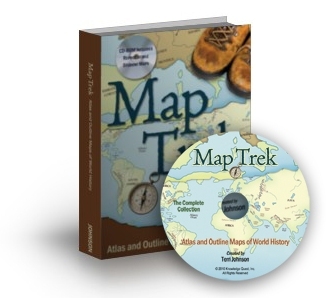 I own all the Maptrek and find it to be the ultimate map resource!